From Jerusalem to the Dead Sea is fewer than fifteen miles, but the two are worlds apart. Jerusalem is nearly 2,700 feet above sea level; at 1,300 feet below sea level, the Dead Sea is the lowest spot on earth. The area by the northeastern shore of the Dead Sea is mountainous, barren, and rocky. In early 1947 young Bedouin shepherds, looking for a stray sheep or goat, climbed some cliffs near the Dead Sea. The story they told is that Muhammed Ahmed el-Hamed, nicknamed “The Wolf,” threw a stone into one of the caves on the side of the cliff, thinking that he would frighten the animal. Instead, he heard the breaking of pottery. With effort, he lowered himself feet first into the cave in the hope of finding some treasure. But all he found in the dark and smelly cave were jars containing ancient scrolls wrapped in linen. He took three scrolls with him and ran to show them to his cousins. The Bedouin boys returned to the cave hoping to find some real treasure instead of “worthless” scrolls, but found only four more—seven scrolls all together—that they put in a bag. They took the bag back to their village and hung it on a tent pole. When The Wolf first left the cave, he most likely had in his hands the Great Isaiah Scroll, the Habakkuk Commentary, and the Manual of Discipline. The Great Isaiah Scroll is the the oldest complete biblical manuscript ever discovered. The Manual of Discipline was written for those who wanted to join the Qumran community that had hidden the scrolls. These “worthless scrolls” were the greatest manuscript discovery of modern times. the Syrian Orthodox Archbishop of Jerusalem, Metropolitan Athanasius Samuel, for about $250. In November, 1947, on the same day that the United Nations voted to create a Jewish state for the first time in two thousand years, the remaining three scrolls were sold to an archaeology professor named Eleazer Lipa Sukenik, who carried them back to Jerusalem from Bethlehem in a paper bag on a bus. 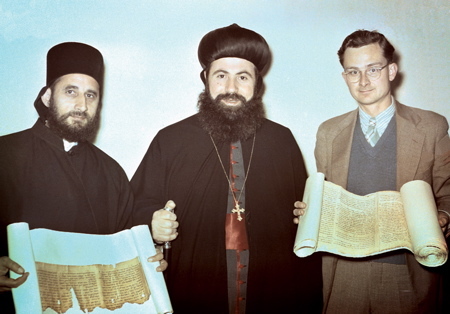 Archbishop Samuel wanted to sell his four scrolls to raise money for Palestinian refugees, but when he failed to find a buyer, he took them to the United States where they were displayed at the Library of Congress. Meanwhile five other caves near the first one were explored, other fragments found, and the buildings of the community at Qumran were discovered on a dry plateau about a mile from the shore of the Dead Sea. Biblical Manuscripts dating back to at least 200 BC, are for sale. This would be an ideal gift to an educational or religious institution by an individual or group. Box F 206, The Wall Street Journal. The four scrolls were purchased for $250,000 on behalf of the state of Israel by Yagael Yadin, but Yadin did not let Metropolitan Samuel know who was really buying them. Now all seven of the intact Dead Sea Scrolls were in the hands of the Israeli government, which built the Shrine of the Book, a museum in Jerusalem, to house them. The money Samuel received for the scrolls never helped Palestinian refugees or Syrian Orthodox churches. Because some legal documents were not properly drawn up, the money was reported as personal income for Samuel and most of the money went to the United States Internal Revenue Service!